Wien, Tom and Suzanne Gousse. "Filles du Roi". The Canadian Encyclopedia, 08 September 2016, Historica Canada. https://www.thecanadianencyclopedia.ca/en/article/filles-du-roi. Accessed 19 April 2019. Unmarried women sponsored by the king to immigrate to New France between 1663 and 1673. Private interests gave priority to bringing over male workers, and the French government and religious communities wanted to correct the gender imbalance in the colonies. A view of women coming to Quebec in 1667, in order to be married to the French Canadian farmers. Talon and Laval are waiting for the arrival of the women (Watercolor by Eleanor Fortescue Brickdale, 1871-1945. Courtesy of Library and Archives Canada, Acc. no 1996-371-1). Unmarried women sponsored by the king to immigrate to New France between 1663 and 1673. Private interests gave priority to bringing over male workers, and the French government and religious communities wanted to correct the gender imbalance in the colonies. 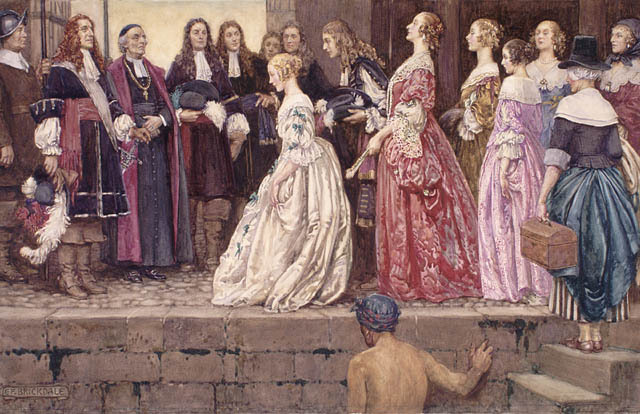 The king’s advisor, Minister Jean-Baptiste Colbert, sent the “Filles du Roi” as an incentive for male workers who had finished their contract and soldiers of the Carignan-Salières regiment (which had just been demobilized) to settle in the colony. The Filles du Roi (King’s Daughters) were unmarried women and sometimes widows who were sponsored by the king to immigrate to New France between 1663 and 1673. Because private interests gave priority to bringing over male workers, the French government and religious community attempted to correct the gender imbalance in the colonies. Even though the first women arrived in Canada in the 1630s, only the 800 or so who arrived during the first 11 years of royal government in New France were called Filles du Roi. The first female immigrants to Canada came either with their families or as nuns. Private recruiters, religious communities and landowners also sponsored small groups of unmarried women, hoping that they would start families. The number of eligible women was not nearly enough to fulfill the needs of the colony. In the 17th century, Marguerite Bourgeoys used the expression “Filles du Roy” on one occasion to designate the 17 “filles à marier” (marriageable women) whom her community of teachers accommodated while they were waiting to find a husband. The king’s advisor, Minister Jean-Baptiste Colbert, sent the “Filles du Roi” as an incentive for male workers who had finished their contract and soldiers of the Carignan-Salières regiment (which had just been demobilized) to settle in the colony. The king took charge of recruiting, clothing and covering the cost of the royal wards’ travel within France and across the Atlantic. He gave each an allowance of 100 pounds: 10 pounds in recruitment fees, 30 pounds to gather a modest trousseau and 60 pounds for each woman’s passage fee. The women — orphans with very little money — were recruited from the regions of La Rochelle, Rouen and Paris. Most were from urban areas. They were approximately 16 to 40 years old when they arrived, with an average age of 24. Between 1667 and 1672, many women (41%) were given a royal dowry of 50 livres tournois (pounds) in addition to their trousseau. Some received even higher amounts (100 or 200 pounds). In years of financial hardship, the dowry of 50 pounds was replaced with provisions from the king’s storehouses in the colony. As in France, these women were expected to be able to feed and clothe their families. Each received a hope chest containing personal accessories: a comb; two coiffes (a type of hood), one made of taffeta and the other of gauze; a belt; a pair of hose; a pair of shoes; a pair of gloves; a bonnet; shoelaces; and four sets of laces. These items were difficult to find on the shores of the St. Lawrence. The chest also contained sewing supplies: about 100 needles, a case and thimble, white and grey thread, scissors, many pins, two knives, and cloth fine enough to make handkerchiefs, collars, wimples and pleated sleeves. Upon their arrival in Canada, the women received room and board until they were married. Almost all were married quickly. According to administrative reports, many were ill prepared for the arduous life in rural Canada. However, they rose to the challenge: because of the sparse population and the wealth of food resources in their new home, they were able to have many children and to live longer than their peers who had stayed in France. The Filles du Roi, who had many offspring, are the maternal ancestors of thousands of North Americans. Because they came from the French-speaking regions and institutions of France, they contributed to Louis XIV’s longed-for standardization of the French language in 17th-century Canada. Commemorative plaques in their honour can be found in the historic district of Vieux-Québec (Maison Barbel) and in Montréal (Maison Saint-Gabriel). In 2013, the 350th anniversary of the first voyage of the Filles du Roi was celebrated with various commemorative activities in both France and Québec. The Québec Ministère de la Culture et des Communications designated the arrival of the Filles du Roi in New France a historic event on 11 July 2013. The role of the Filles du Roi in populating North America was also highlighted in a temporary exhibition for the 350th anniversary of the arrival of the Carignan-Salières regiment, presented at Château Ramezay in collaboration with the Commission franco-québécoise des lieux de mémoire communs. Émilia Chicoine (cnd), La métairie de Marguerite Bourgeoys à la Pointe-Saint-Charles (Montréal : Fides, 1986). Leslie Choquette, De Français à paysans. Modernité et tradition dans le peuplement du Canada français (Québec/Paris : Septentrion/Presses de l’Université Paris-Sorbonne, 2001). Silvio Dumas, Les Filles du roi en Nouvelle-France. Étude historique avec répertoire biographique (Québec : Société historique de Québec, 1972). Yves Landry, Orphelines en France, pionnières au Canada. Les Filles du roi au XVIIe siècle ; suivi d’un répertoire biographique des Filles du roi (Montréal : Leméac, 1992). Marcel Fournier, « Des Filles du roi qui n’en sont probablement pas? », Mémoires de la Société généalogique canadienne-française, vol. 65, cahier 281 (automne 2014) : 227–232. Maud Sirois-Belle, « Les Filles du Roy, des bords de Seine au Saint-Laurent », Commission franco-québécoise sur les lieux de mémoires communs, Mémoires vives, Bulletin n° 32 (juin 2011). Les Filles du roiAn article about the history of the Filles du roi. From the Encyclopédie du patrimoine culturel de l'Amérique française. In French. Les Filles du roi Article about the role of Filles du roi in New France. In French. Château Ramezay – Historic Site and Museum of MontréalThe website for the Château Ramezay – Historic Site and Museum of Montréal.